Shadow and Bone by Leigh Bardugo is a fantasy novel set in Russia. And all I can say is wow! Bardugo somehow was able to make me fall in love and then break my heart, all before I'd even finished the first chapter. Her writing is beautiful and powerful and I could not get enough. Shadow and Bone was the perfect book... for me, anyway. It gave me everything I could ever ask for. A strong heroine, a strong and caring love interest, an evil, yet devastatingly attractive and manipulative villain, and a great cast of supporting characters with whom I fell in love. Alina is a spunky heroine and I felt like I could relate to her. Throughout Shadow and Bone there wasn't one time where I noticed her making a bad decision. That's unusual for me in most books. Usually, at some point, the main character does something that's just too stupid for words, which then brings mass amounts of bad right down on their heads. But not Alina. Sure, she might trust the wrong people, but I found myself trusting them, too. Or, at least, wanting to trust them, just like Alina. Alina doesn't cause her own problems with her poor problem solving skills. She is manipulated and forced into situations that are beyond her control, but she overcomes it. And I cannot wait to see what happens next for her. Mal is sweet and really cares about Alina, but he's a player, and Alina knows it. She likes him, but knows he doesn't feel the same way and has to constantly keep how she feels a secret from him because the last thing she wants is to ruin their friendship. They've been best friends since childhood. Not only that, they are each other's only family, having grown up in an orphanage. They need each other, but neither quite understands how their relationship is changing. And I liked that so much! There was not even a trace of insta-love in Shadow and Bone. The romance is always there in an undertone, but it doesn't really kick in until the last third of the book. And when it does, you can see the sincerity of it, in the awkwardness and the anger and guilt and confusion. I have to admit, I totally fell for the Darkling, too. He is one mysterious dude, and when his secrets finally surface all I could think was, "No!" Bardugo has such a way with her characters. She knows exactly what to do to make the reader fall in love, or distrust, or feel sympathy. So it was no surprise that I liked the Darkling as much as I did. I really liked him and so did Alina, but Shadow and Bone doesn't have a typical love triangle. Alina loves Mal, always has. But the Darkling... Well, you'll just have to read it to find out what's going on with him and Alina. I love the setting of Shadow and Bone. I'm in love with all things Russian when it comes to story telling. I think there is just something so magical about the language and locations and fairytales and legends. Bardugo combined the just the right amount of description of her setting and action to show the beauty of Ravka, without slowing the pace of the story or boring the reader. Shadow and Bone left me feeling completely satisfied, yet still craving the next book in the Grisha series. It was a book I never wanted to put down. If you're into fantasy or paranormal romance than this is the book for you. It's incredible and I now want to erase my memory just so I can enjoy reading it again for the first time! 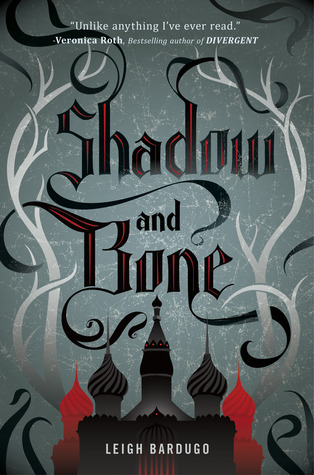 Check out Shadow and Bone at these sites! Check out more Fierce Reads on Facebook! I too love a little of Russia in my life. It's a country that is magical and rich with culture and history. What's not to love? Your review is everything that I loved about S&B. I cried and cried, and even giggled a little bit reading this book. I absolutely ADORED Alina - she's now one of my favorite heroines ever! Mine too! I loved Alina so much. I felt bad for her but she wasn't a "poor me" kind of girl. She was tough without being obnoxious and that definitely puts her up near the top of my fav heroines list.